A Cooking Bookworm: Febreze Home Collection Wooden Wick Candle - and Walmart gift card GIVEAWAY! 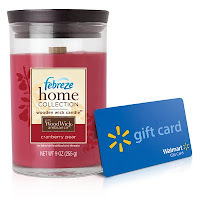 Febreze Home Collection Wooden Wick Candle - and Walmart gift card GIVEAWAY! Although I burn them all year long, as the chillier days of fall and winter approach, I find myself burning candles more often. I was excited to have a chance, through MyBlogSpark, to test Febreze's new wooden wick candles. Available in nine premium scents, these tranquil candles are specially designed with a wooden wick to recreate the ambiance and sound of a crackling fire indoors. Offering a brilliant range of everyday fragrances, Febreze Home Collection Wooden Wick candles can help inspire a scent and design transformation in your home. Be sure to look for Febreze Home Collection Wooden Wick candles at your local Walmart in fragrances like Green Tea Citrus, Pomegranate Mango, Cranberry Pear, Orange Honeycomb, Rosewood Plum and Willow Blossom; as well as seasonal scents that include Anjou Pear Spice, Gingersnap Vanilla, and Yumberry Sangria. When burning Febreze's new candles, I'm not quite sure you'll feel you're sitting in front of a fireplace. You have to listen pretty close for any 'crackling.' But, the candles are strongly and pleasingly scented, and I thought they flickered more than a normal wick, providing a warm and romantic atmosphere. Entries accepted until Monday, November 8, 11:59 PM (EST).Winner(s) will be chosen by random.org and winner(s) will be notified by email. Winner(s) must confirm prize email within 48 hours or another winner(s) will be chosen. I want to try the Green Tea Citrus!! I would like to try the pomegranate mango. I'd like to try the Orange Honeycomb! I'd love to try the Willow Blossom scent! I'd like to try the Willow Blossom. Twitter follower of both and tweeted. I'd love to try the Orange Honeycomb. I would like to try Cranberry Pear. I'd like to try the Ginger Snap Vanilla and Plum one! Thanks! I'd like to try the willow blossom one. The Cranberry Pear sounds great! I'd like Green Tea Citrus. I'd like to try Yumberry Sangria! I'd like to try Willow Blossom. now following The Creative Side of Me gfc. augustlily06(at)aim(dot)com. I'd like to try Orange Honeycomb. augustlily06(at)aim(dot)com. Green Tea and Citrus! I bet it smells wonderful! Thanks for the chance. I would like to try pomegranate mango. The Willow Blossom scent sounds wonderful! I'm already following you on GFC. Thanks! I'm following both you and Febreeze on Facebook user Lisa Garner. I like the Orange Honeycomb scent! I like the gingersnap vanilla scent. I would love to have the Cranberry Pear and/or Anjou Pear Spice.